Hero MotoCorp has just unveiled the Xtreme 200R in India. The motorcycle was first showcased as a concept model at the previous edition of Auto Expo. According to the company. 2018 will be a year of reshaping the brand by venturing into different segments. In line with this plan, the premium segment is first on the radar with the Xtreme 200. A 276mm disc brake up front along with a rear disc brake at the rear as well. ABS (Anti-Lock Braking System) has been offered with the motorcycle as an option. The suspension system of the new Hero Xtreme 200R comprises of 37mm telescopic forks at the front along with an eight step adjustable monoshock at the rear. The motorcycle comes with a dual tone seat and the dual tone graphics lend it a distinct visual appeal. Hero MotoCorp says that the vehicle geometry and ground clearance has been revised for improved agility. The motorcycle gets a digital-analog instrument cluster and it looks like the one in the concept model. As the name suggests, the new Hero Xtreme 200R comes with 200cc, single cylinder, air-cooled engine mated to a five-speed transmission. The engine is good for churning out respective power and torque of 18.1 hp and 17.1 Nm. The engine is the upgraded version of the mill that runs the Achiever 150. The engine gets new balancer shafts to reduce vibrations. The new Hero Xtreme 200R has a reduced intake noise to improve exhaust sound. This is achieved by putting a resonator in the intake box, allowing for further work on exhaust sound. 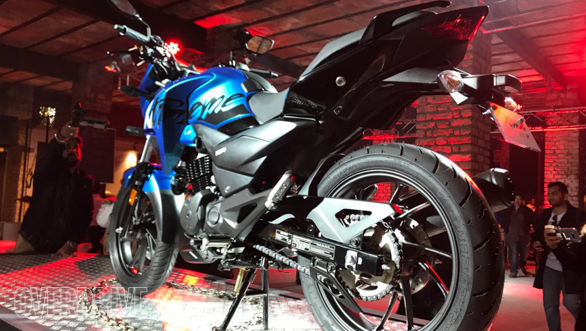 The new Hero Xtreme 200R will challenge the likes of TVS Apache RTR 200 and Bajaj Pulsar NS 200 in the Indian two-wheeler market. Expect the price to stay around Rs 90,000 (ex-showroom) to stay competitive in the 200cc streetfighter territory. The price of the new Hero Xtreme 200R will be announced during Auto Expo 2018. Be the first to comment on "Features of Hero Xtreme 200R unveiled in India"